We no longer see emus roaming our local bush, and sightings of koalas and wallabies are increasingly rare, but many species of the original animals of the area still frequent our reserves and our gardens. 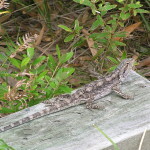 We couldn’t hope to list all the species of fauna found in Marcus Beach and surrounding areas, but this page will eventually include the most important and commonly-encountered ones. The amount of information is limited for space reasons. You are encouraged to click on the links to explore them in more detail. You can help us. One of the factors that limits the comprehensiveness of our animals page is the availability of photos. 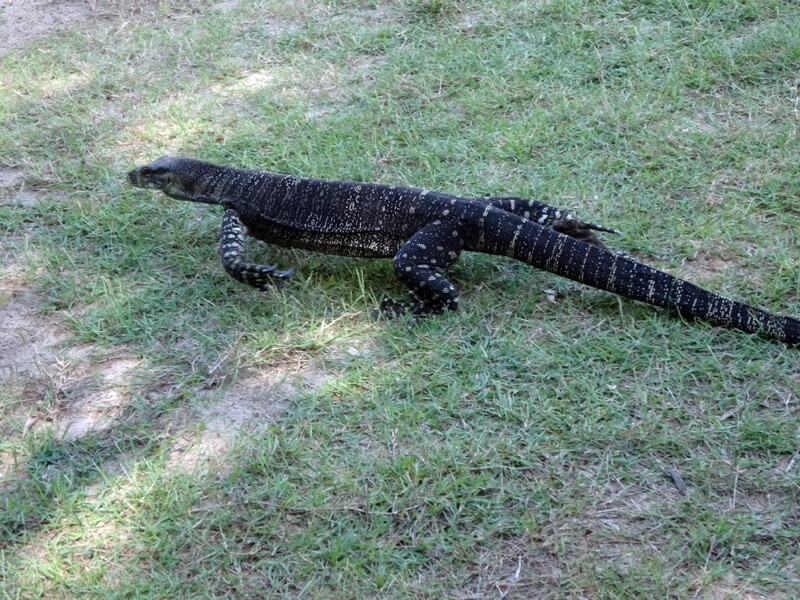 If you’ve got a good photo of a Marcus Beach native animal, taken locally, and you’d be prepared to let us use it, please contact us at info@mbba.org.au. 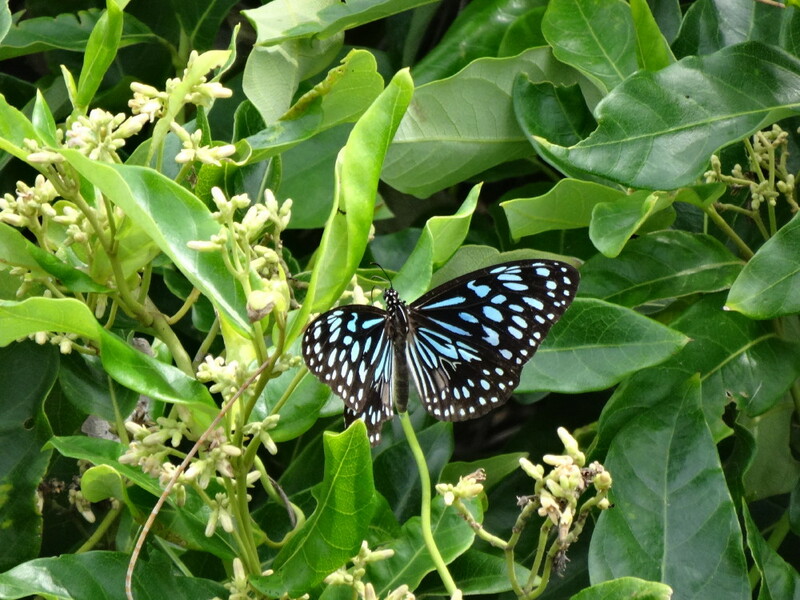 Large numbers of these blue butterflies are often seen flying north along our beaches in autumn. 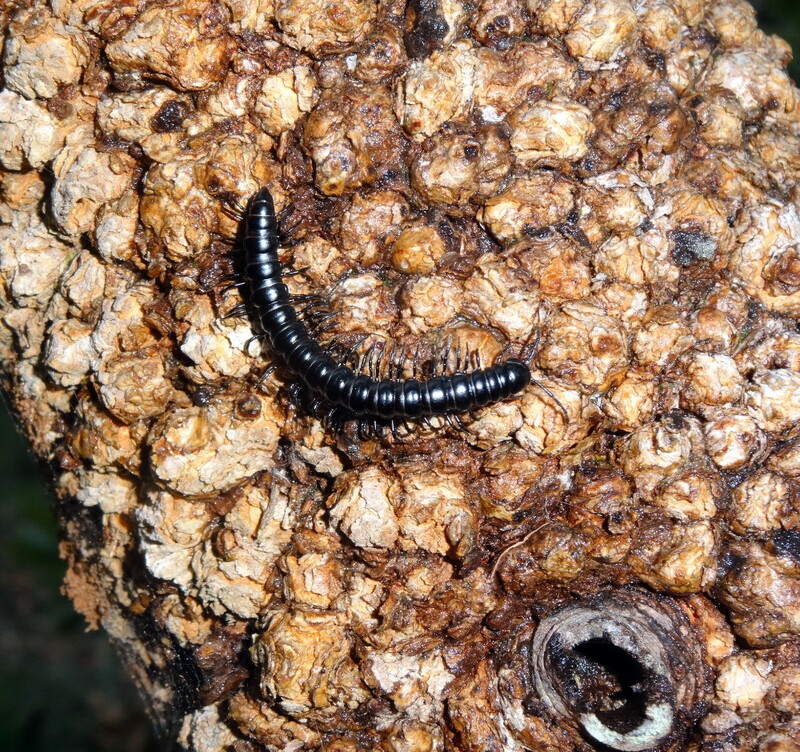 The larvae feed on Corky Milk-vine (Secamone elliptica) on the edge of rainforest. 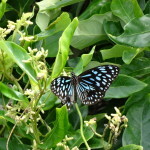 Locally, the adult males often stop off on Monkey Rope vine (Parsonsia straminea), picking up chemicals which help them attract females. 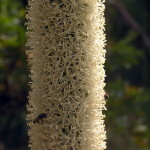 This is one of the social species of native bee. Native bees are much smaller than honeybees and they don’t sting. They build communal nests in tree hollows (or even cavities in houses) where a small amount of ‘sugarbag’ honey is stored. They have an important role in pollinating native plants. 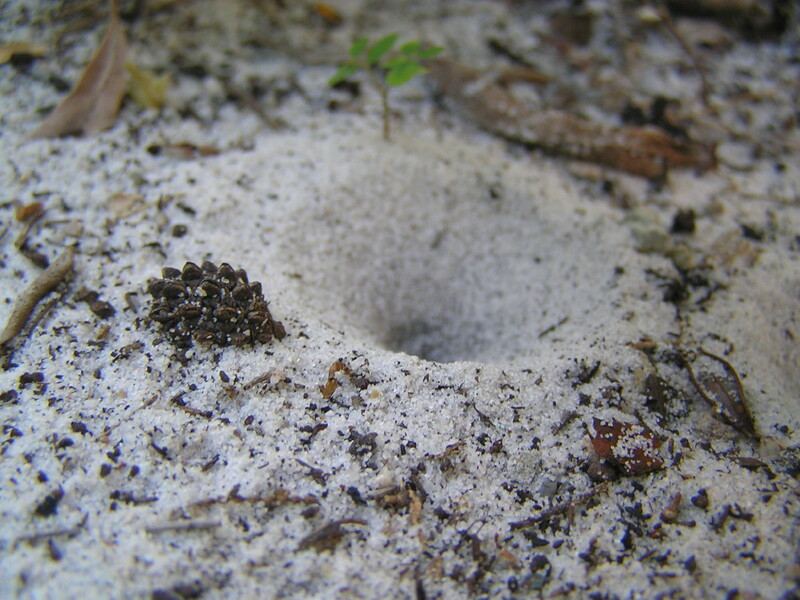 The voracious insect lurking under the centre of this sandy trap is the larval stage of a delicate lacewing. When it detects the sliding sand grains dislodged by a hapless ant, it swirls its long jaws, setting off a landslide that carries the ant into its grasp. 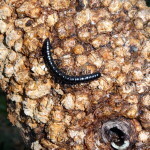 Millipedes feed on decaying plant and animal material, and are often found locally on the trunks of trees where they eat lichen and fungi. They don’t bite and are not venomous like their relatives the centipedes. When disturbed, they may curl up into a spiral shape and can give off acrid, noxious chemicals. 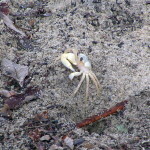 Smooth-handed Ghost Crab, Ocypode cordimanus. 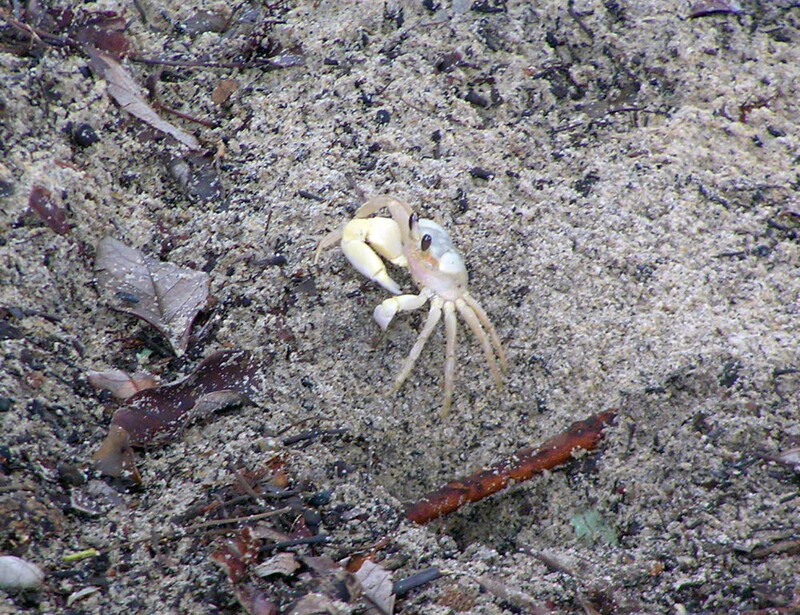 Ghost crabs are a good indicator of the health of our dunal systems. This species is found from the tops of the frontal dunes to about 200m inland. 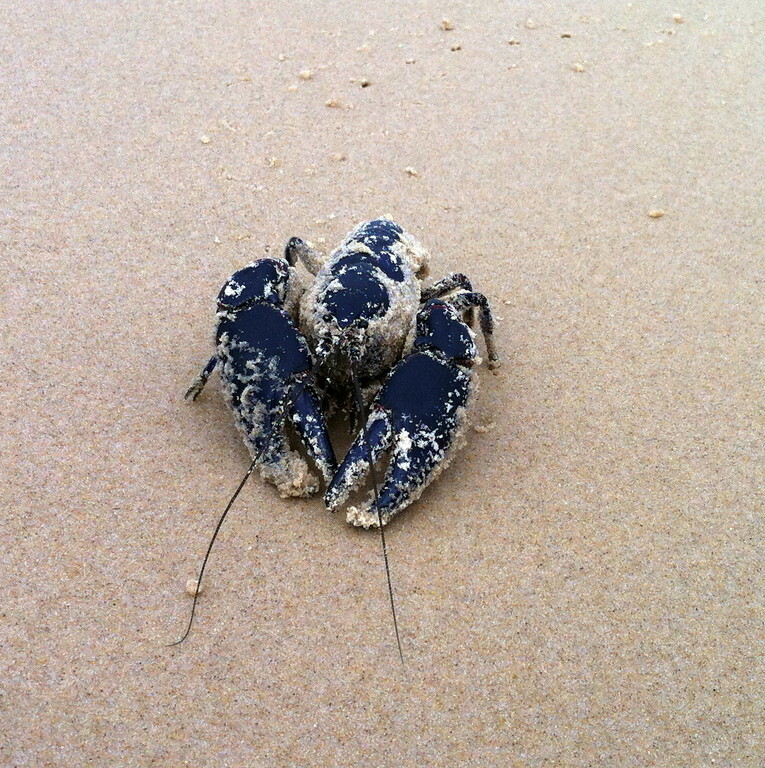 They are opportunistic feeders, eating plant and animal remains they find on the beach. 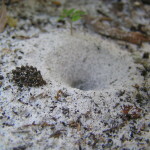 Their burrowing activity helps aerate the soil and recycle nutrients. This yabby is adapted to living in burrows around the edges of acidic waterways in peaty sand areas, so is found only in wallum heathlands. 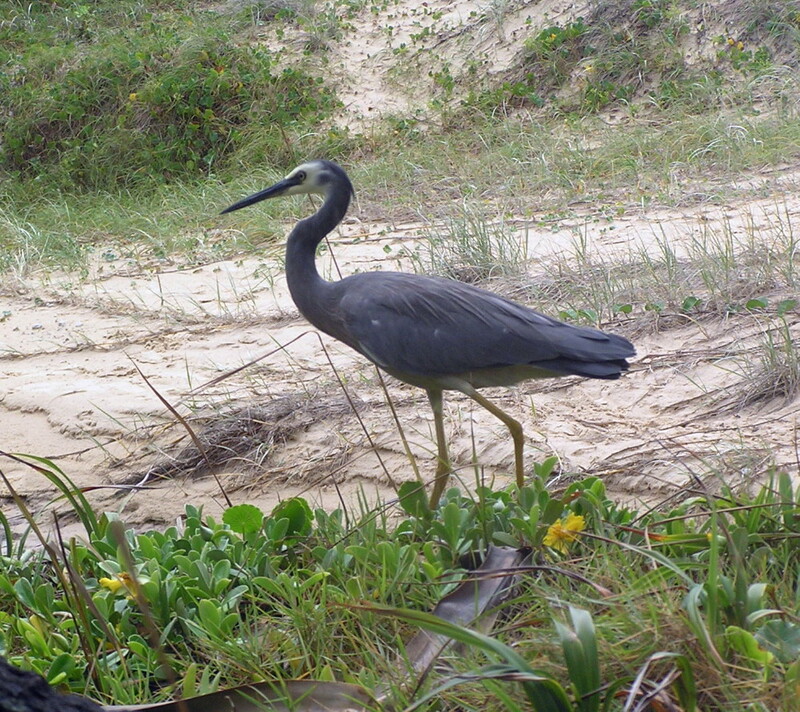 Once found in coastal South-East Queensland from Fraser Island south, it has disappeared from Brisbane to the border, although it’s still found on Stradbroke Island. 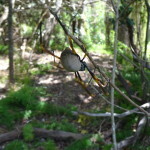 These spiders build strong, permanent, golden-yellow webs suspended between trees and shrubs to catch insects and even small birds. The females (shown in the photo) are much larger than the males. They don’t bite unless severely provoked and are not venomous to humans. 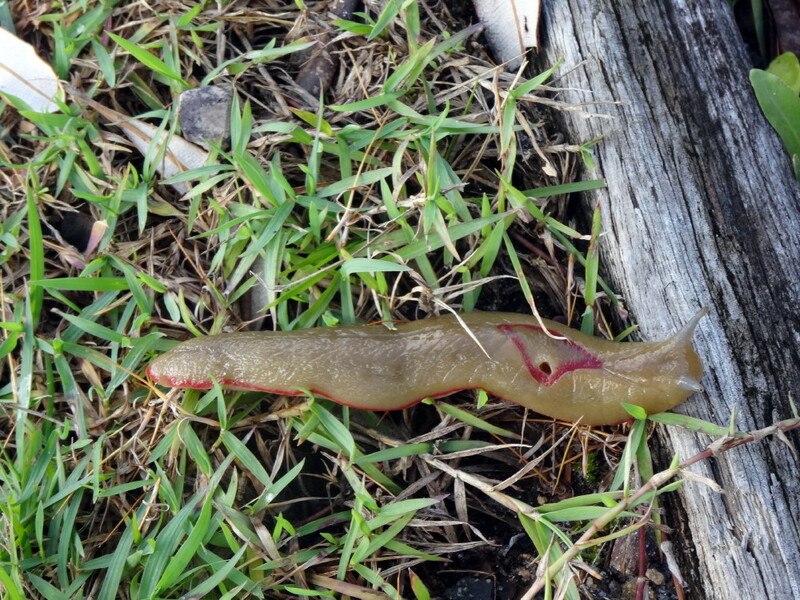 These are our largest land slugs and they can vary in colour from white to pink or olive-green. 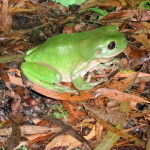 They are found in damp habitats, often in our gardens where they feed on the algae that grow on rocks and tree trunks. There are reports of them entering houses and eating the mould growing on walls. 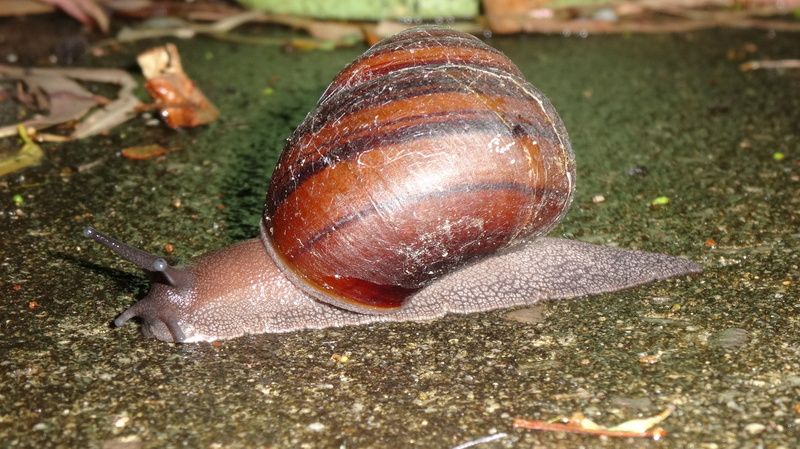 These snails live under rocks and logs and are often found in gardens. They are active at night and can reach up to 5.5 cm in diameter. They feed on decaying leaves and bark, algae, fungi and lichen. 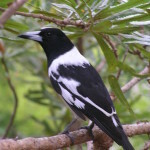 Their range is restricted to the coast from the Clarence river to Gympie. 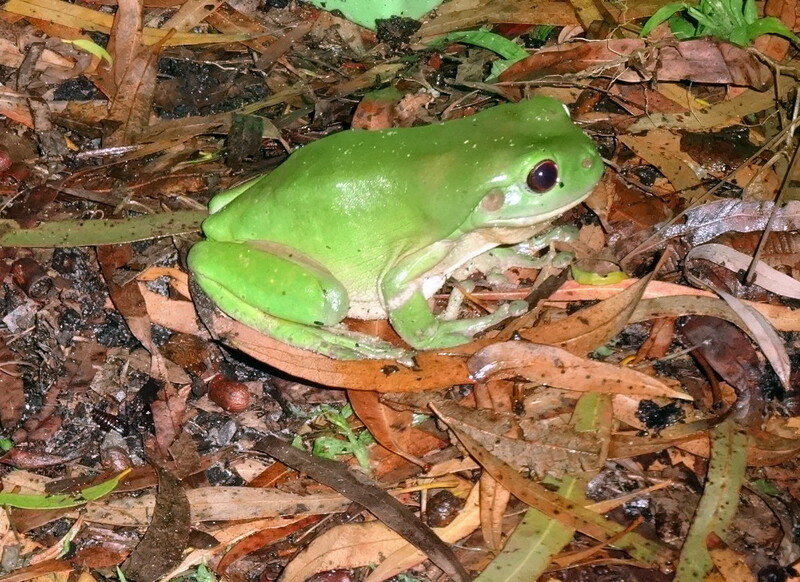 Most houses in Marcus Beach reverberate to the loud croaking of these frogs in the downpipes or drains whenever rain begins. At night, they gather around external lights where they can feast on the insects attracted. Eggs are laid in local ponds. The tadpoles are brownish and swim individually; cane toad tadpoles are black and swim in swarms. 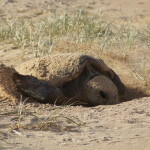 Female loggerheads lay their eggs on the dunes of our beaches during the summer months. Each nest contains about 120 eggs the size of table-tennis balls and the hatchlings scramble back to the sea around February or March. Feral animals such as foxes are a threat. 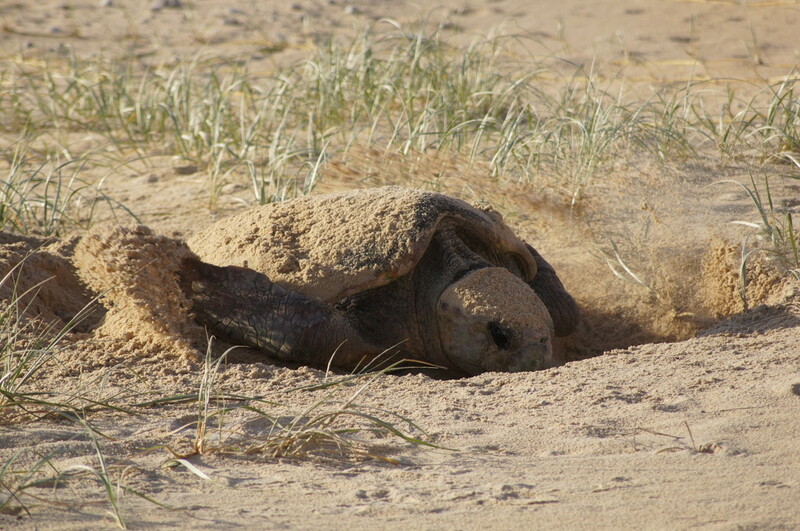 Volunteers from Coolum Coastcare help protect our local turtles. 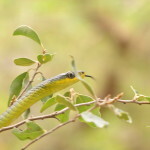 Green Tree Snake, Dendrelaphis punctulata. These shy, non-venomous snakes vary from light green through brown, even to black and can be up to 2 metres long. Their bellies are yellow, and when disturbed, they often show flashes of blue between the scales. 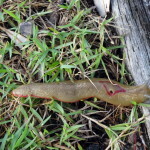 Locally common, they are active during the day, feeding on frogs and skinks. 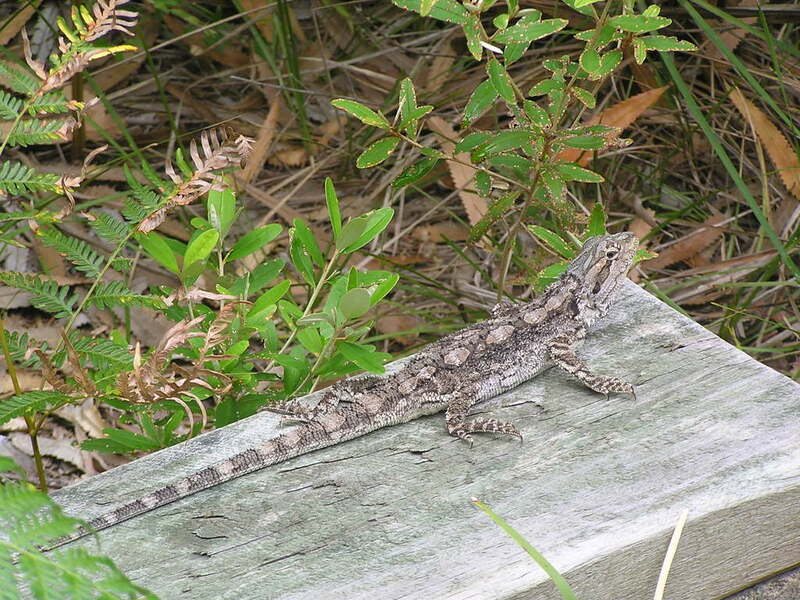 Eastern Bearded Dragon, Pogona barbata. Bearded dragons are commonly called frilly lizards, but this name confuses them with the frill-necked lizard of Northern Australia. 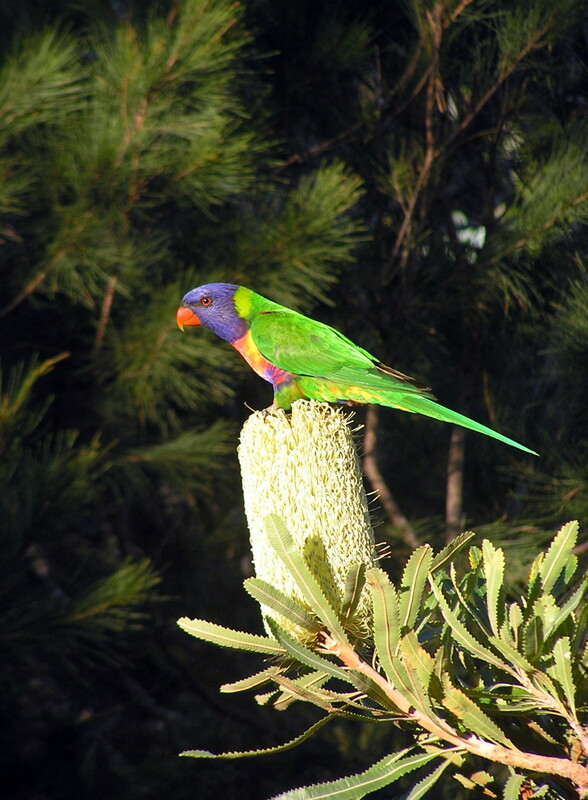 They are often seen perched on logs or branches where they wait for skinks and insects to feed on. When disturbed, they puff up their ‘beards’ and open their mouths to show the yellow lining. 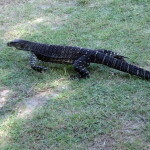 These goannas can grow to over 2 metres long. 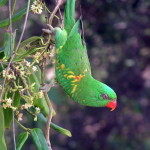 They spend most of their time in trees but will scavenge food on the ground, scrambling back up the trees when threatened. 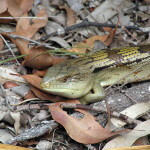 They eat insects, reptiles, small mammals, birds and eggs and are often found raiding local chook pens. Their own eggs are laid in termite nests. 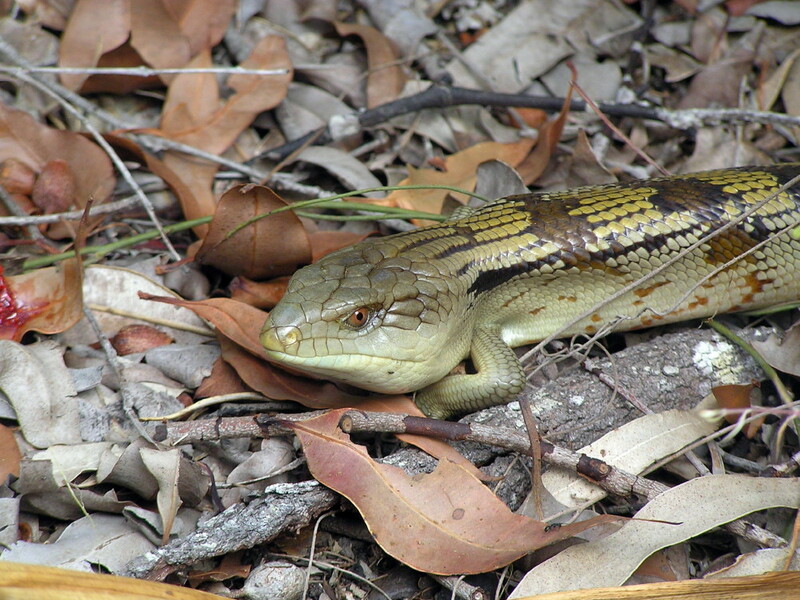 Blue-tongues are large, stocky skinks that move slowly and use a hissing display of their blue tongues to bluff predators. They live happily in suburban gardens, feeding on flowers, berries, eggs, insects and other small animals. Their young are born live. 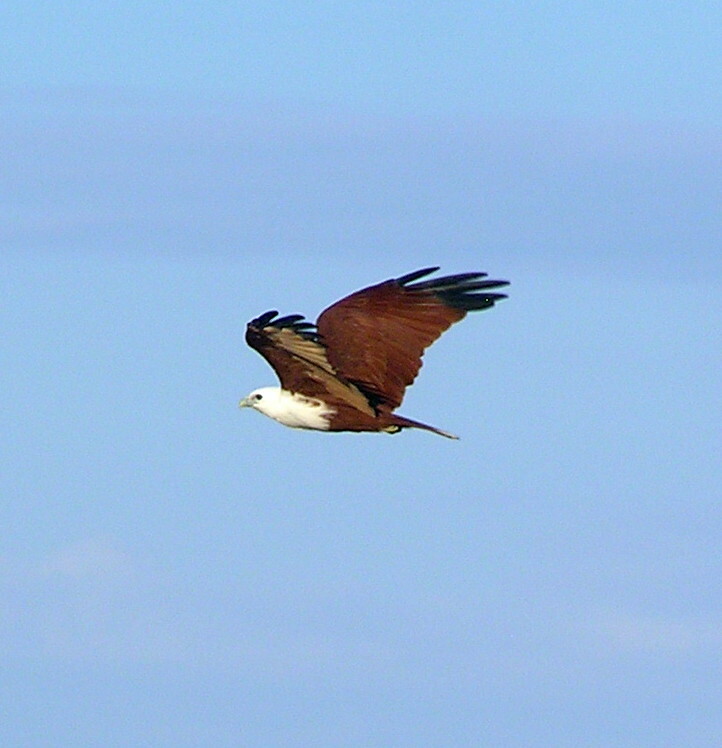 These striking birds of prey can be seen soaring high above our beaches, swooping down to seize unwary crabs or even the bait from fishermen’s untended buckets. They eat insects, reptiles, fish and carrion, and will rob prey from other birds in flight. 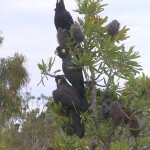 Nests are built in trees near the beachfront. 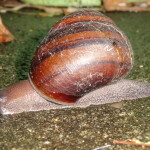 ‘Glossies’ have dull black bodies with red panels on the tails. 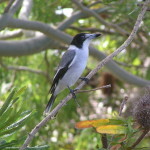 Females and juveniles have some yellow feathers around the head. 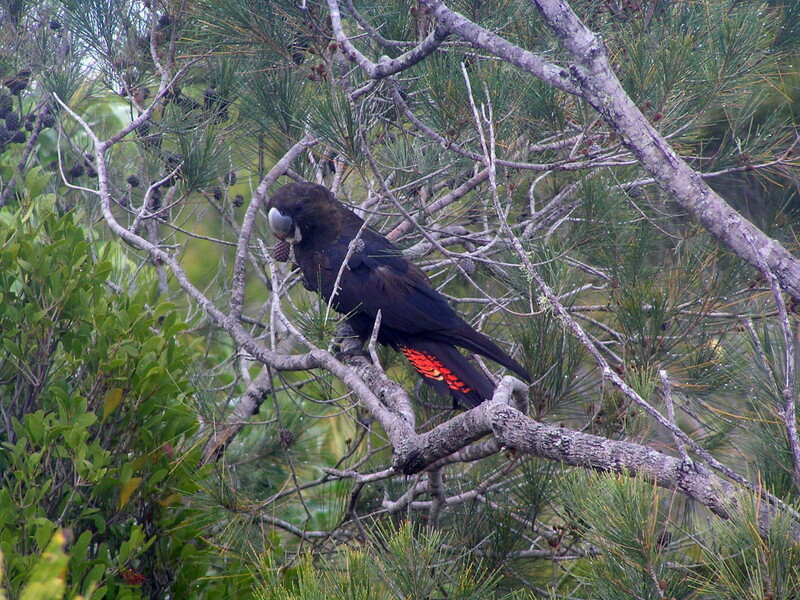 They feed quietly in groups on the seeds of casuarina trees. In this area they choose the black she-oak (Allocasuarina littoralis), and only particular favourite trees at that. They mate for life and breed in tree hollows. These are large birds with a characteristic, graceful flight. 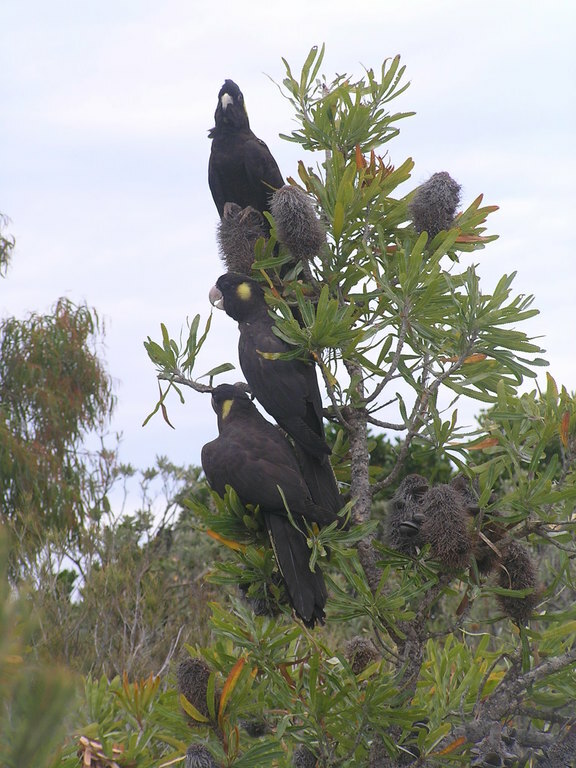 They feed noisily in groups, and in this area it’s usually on banksia seeds. 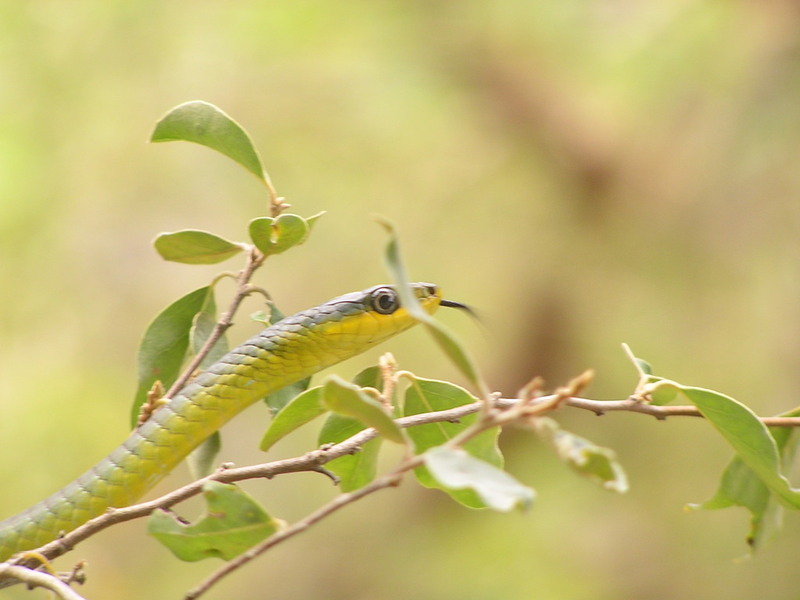 They also use their powerful beaks to dissect branches for insect larvae. They nest in tree hollows, and normally only one chick survives per season. 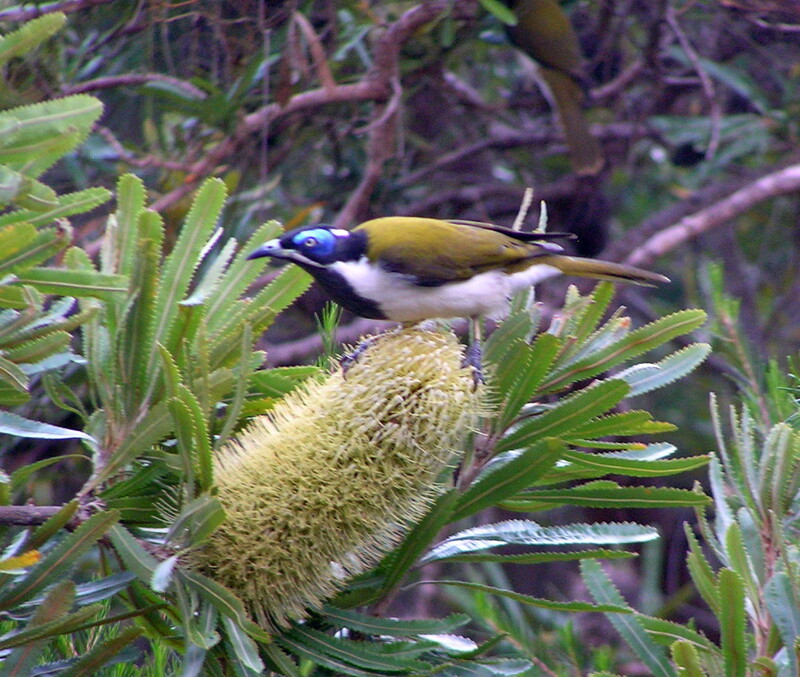 Noisy flocks of these birds are found wherever native trees are flowering. 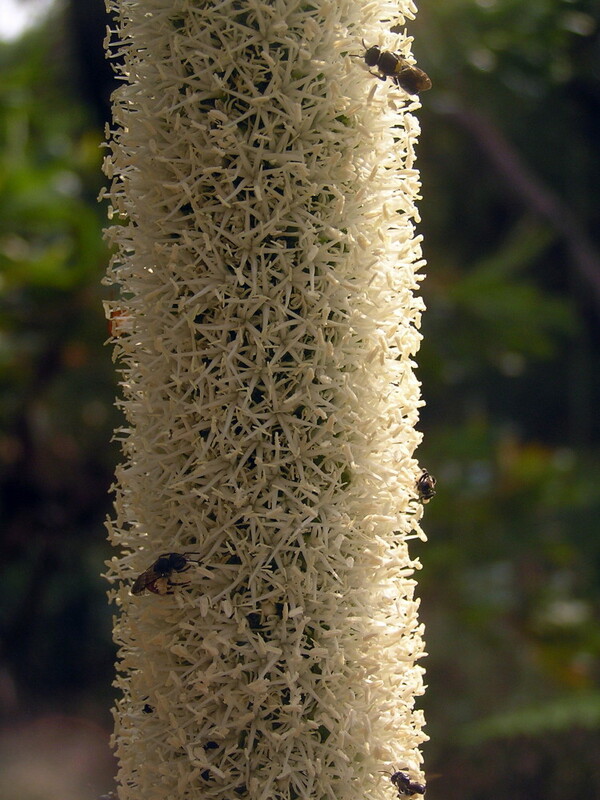 Their brush-like tongues are adapted to extracting pollen and nectar. 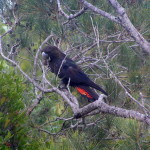 Locally, they also feed on casuarina seeds. Some people like to feed them, but this is not recommended because it can spread diseases. 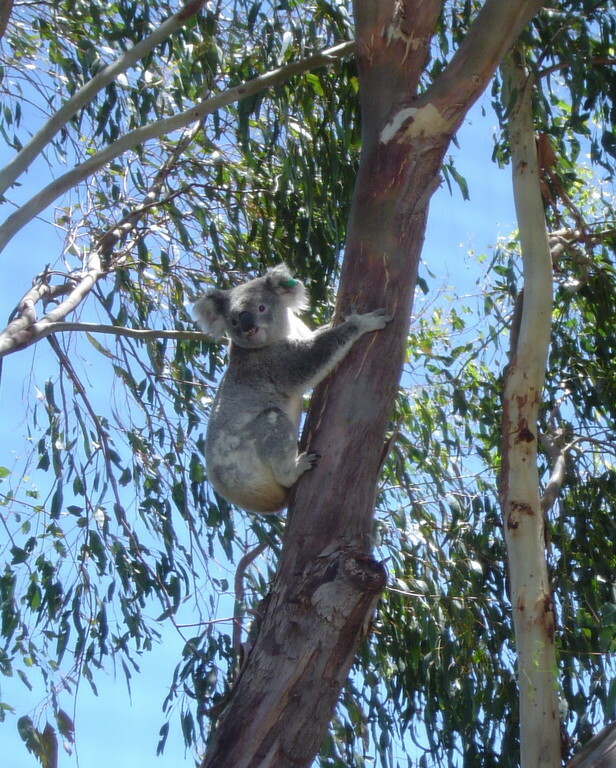 They breed in hollows of old eucalypt trees. 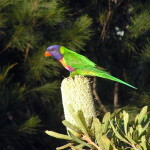 Once very common, these birds have declined, possibly due to artificial feeding which has favoured their slightly larger and more aggressive relatives, the Rainbow Lorikeets. 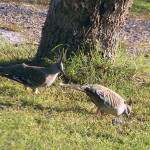 The two species have similar feeding and breeding habits, and are often found in flocks together. 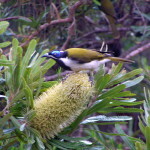 These honeyeaters, with patches of bare blue skin around their eyes and golden-olive backs are unmistakeable. The juveniles have greenish yellow eye-patches. They feed on insects as well as nectar and fruit and usually breed in second-hand nests that have been abandoned by other species. 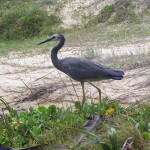 Commonly seen feeding in the shallow mouths of our creeks, these herons are found all over Australia as well as in neighbouring countries. They eat any small animals including insects, frogs, fish, crustaceans and small mammals. 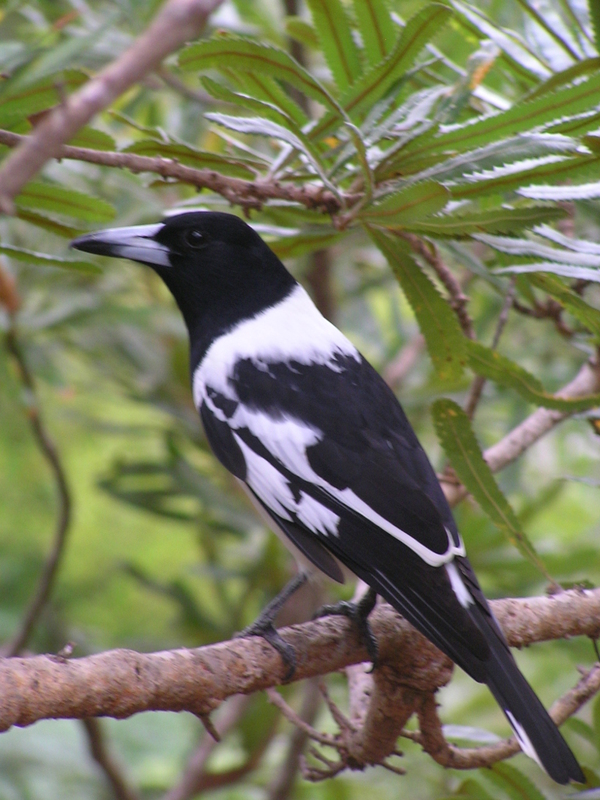 Most breeding occurs in Southern Australia in spring, and the birds disperse widely at other times. 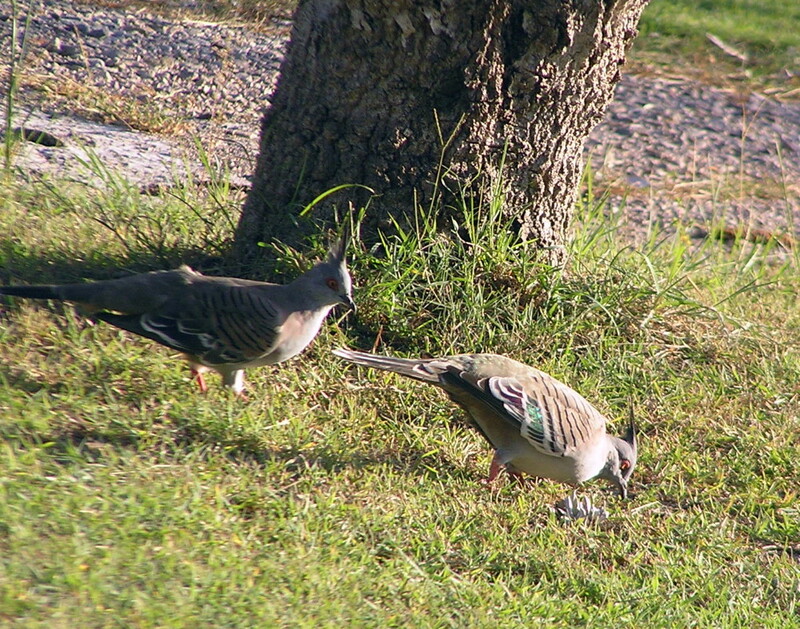 Once found only in inland Australia, these pigeons have now colonised urban areas. 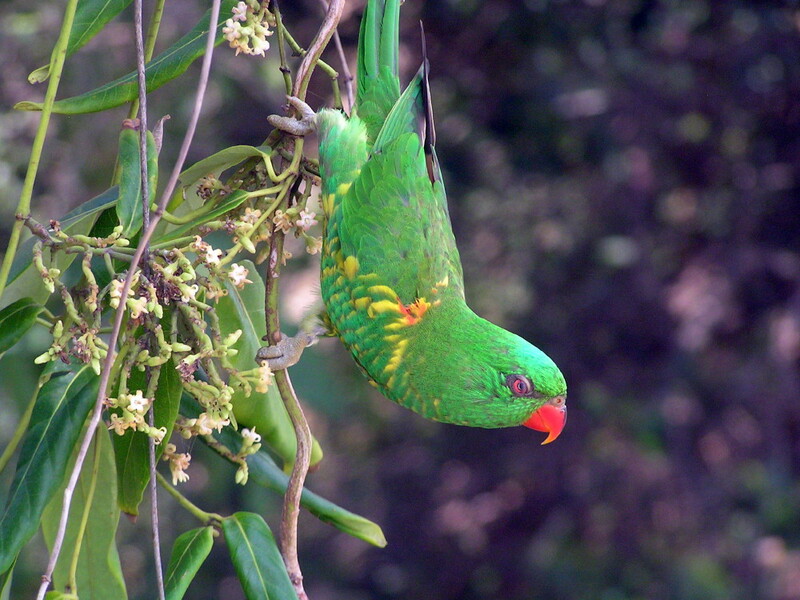 They are known for their whistling flight and the elaborate mating dances of the males. They eat mostly seeds, but also leaves and some insects. The females lay two eggs, and both parents incubate and care for the young. These assertive birds, with their rich piping songs, are welcome visitors in many local gardens. 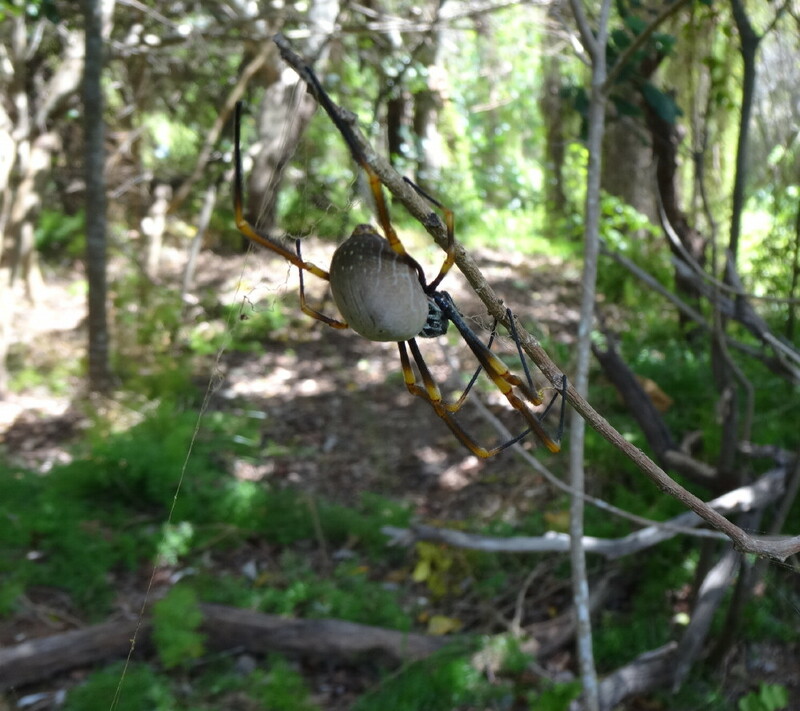 They feed on insects, reptiles and smaller birds as well as some berries and seeds. The juvenile birds stay with the family group for about a year, helping to raise the young of the next season. 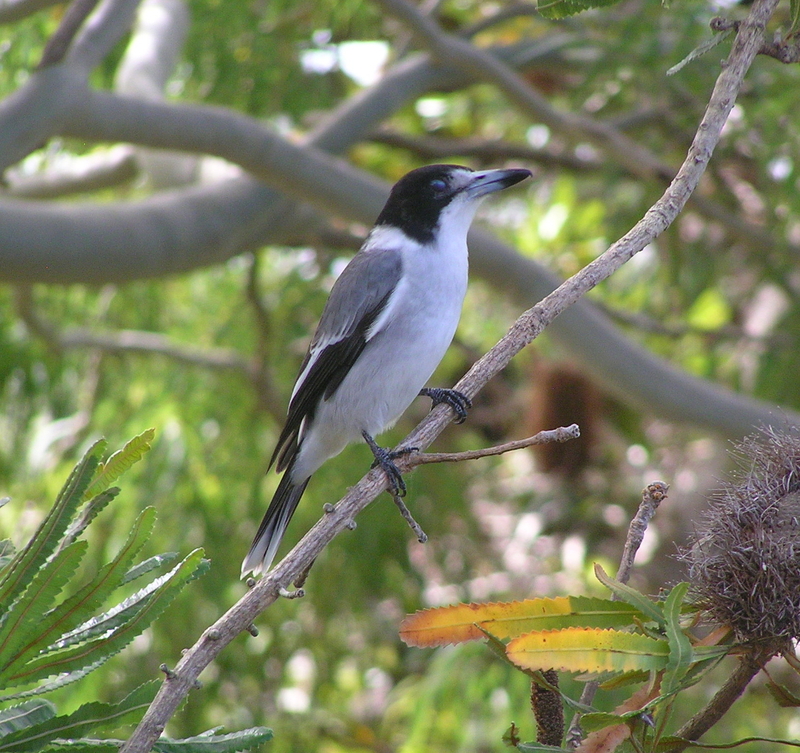 Slightly larger than Grey Butcherbirds, and more boldly marked, Pied Butcherbirds have even more beautiful, haunting songs than their cousins.They eat insects, lizards, frogs, small reptiles and birds and family groups are often seen hunting in local gardens. 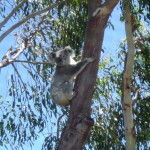 No, the koala signs in our local streets are not just tourist gimmicks. Not long ago it wasn’t unusual to see one of these furry creatures in a tree or walking on the ground between them. The loud snorting bellow of the males has woken many a sleeping local resident. Sadly, those days may be gone due to habitat destruction and urbanisation.